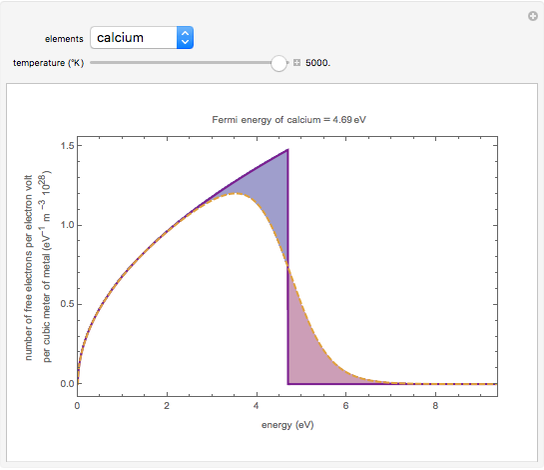 This Demonstration shows the variation in density of free electrons as a function of energy (in eV) for some representative metals at different temperatures . 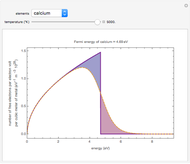 According to the Fermi–Dirac distribution, the number of free electrons per electron volt per cubic meter is given by , where is the Fermi energy of the metal and is the Boltzmann constant. 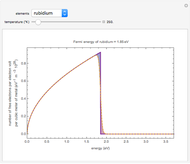 The dashed orange lines show the density of free electrons as a function of energy. 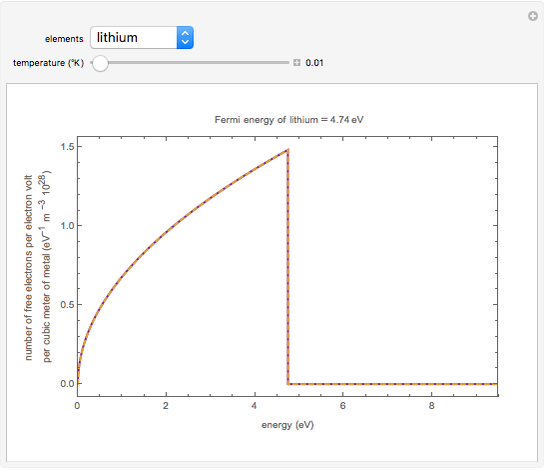 The area under each curve equals the total number of free electrons per cubic meter of the metal. The blue area shows where electrons have vacated energies in the neighborhood of . The red area shows the electrons that have acquired energies greater than as the temperature is increased. 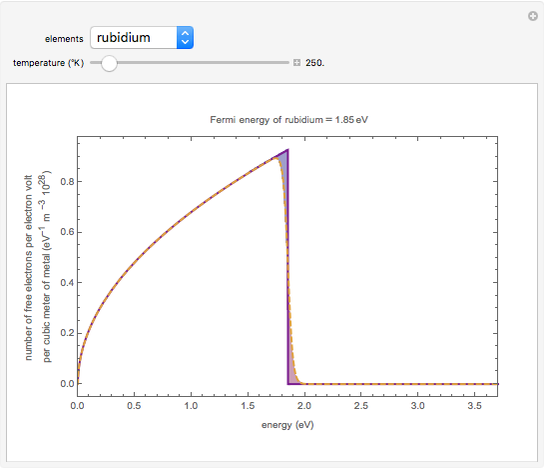 For reference, the distribution of energy of free electrons at 0.001 °K is shown with bold purple lines. Fermi energy of elements and inadequacies inherent in the free electron model are taken from N. W. Ashcroft and N. D. Mermin, Solid State Physics, New York: Holt, Rinehart and Winston, 1976. Details on the density of free electrons per electron volt are taken from C. Kittel, Introduction to Solid State Physics, 5th ed., New York: Wiley, 1983. 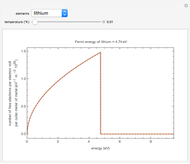 Additional information on the free electron model can be found on Wikipedia. Kallol Das (St. Aloysius College, Jabalpur, India) "Fermi-Dirac Distributions for Free Electrons in Metals"